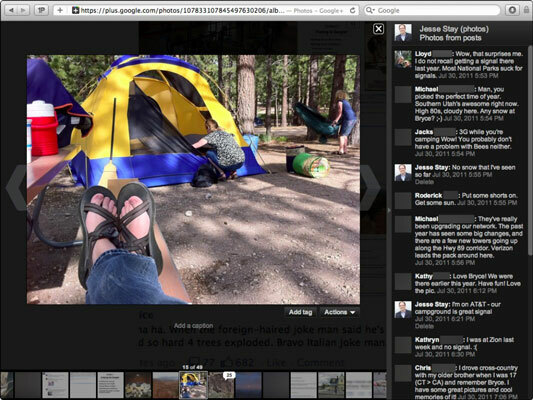 A fun and easy way to browse Google+ is by viewing the pictures your friends have uploaded. Just go to the default photos page or click the Photos from Your Circles link in the left column of the photos page. The photo: The photo is usually a pretty good resolution. This characteristic makes it an ideal environment for photographers wanting to share their photos with friends and clients. Actions: If you click Actions, a drop-down list will appear where you’ll see options like Photo Details and Report Abuse. You can report the photo via this means. Or if you click Photo Details, you can get detailed information that the camera stored about the photo (if it’s available – some cameras do not store this information). This includes things such as exposure, aperture, shutter speed, camera type, and even location. Tagging: You can tag other friends using this button. Next and previous photos: These are all the photos in sequence. You can also use your arrow keys to navigate. Comments for the photo: In the right column you can comment on each photo or picture. The individual photo view in Google+. Commenting on photos is easy! Just click the photo you want to comment on and click in the box that says Add a Comment.